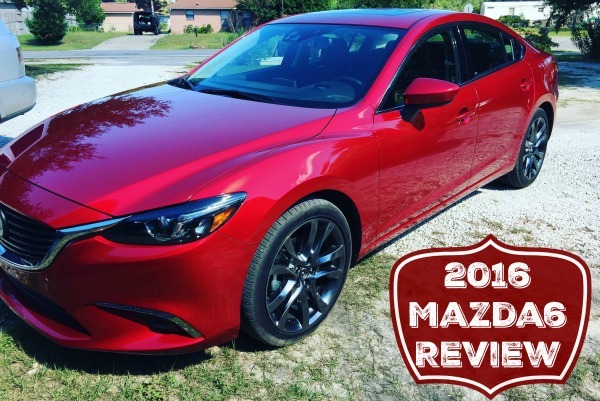 When you are looking for a car that is sport, family friendly and is nice to you on the gas usage, then you might want to consider the 2016 Mazda6. I had the chance to review this sporty vehicle thanks to Drive Shop USA. I admit I did not want to give it back at all, and when I am not toting three kids around full time, it’s one I would be more than happy to drive. The soul red color is one of my favorite colors and adds to the overall sporty look of the vehicle. 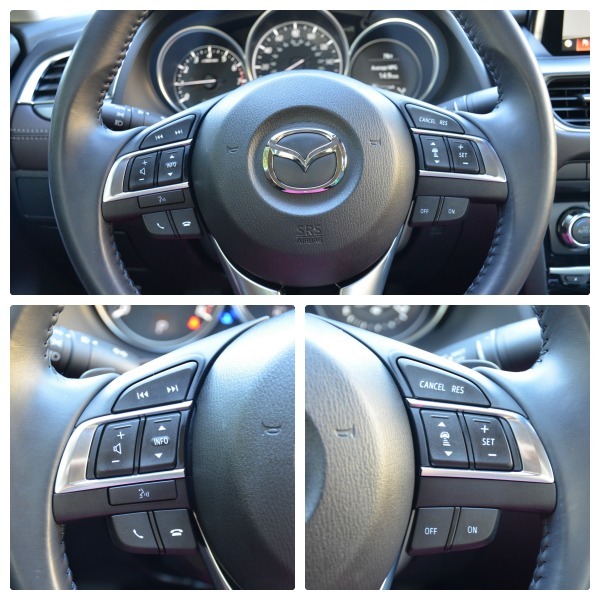 The 2016 Mazda6 we received had the grand touring package, so it came with all the bells and whistles! The leather seats are very comfortable and seeing as we had to sit in them for 8 hours on a trip to Orlando; I can assure you the comfort level is perfect. The front seats even have heat which makes those long car rides. The 8-way power driver’s seat with power lumbar support and seat memory for two settings means that you can travel with ease. With the touch of a button, the seat will adjust to your preferred configurations, so no more changing multiple things when you are ready to drive. The passenger is a 6-way power seat but no memory, so you will have to adjust this for each rider. 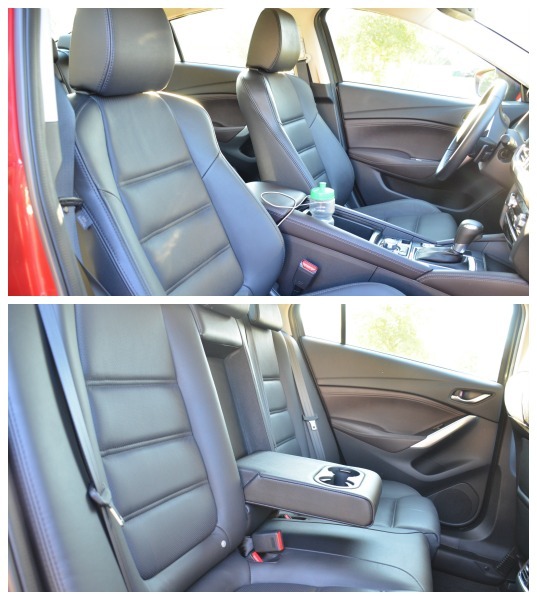 All five passengers will have 3 point safety and of course, in the back it offers latch child safety seat anchors! You can feel safe in this sporty vehicle. When you are driving, it’s nice to have everything right at your fingertips. Cruise control, music controls, voice command, phone answer and even car between distance are all readily available so you aren’t having to move around too much while driving! The dash information system gives you all the data you need at a glance. 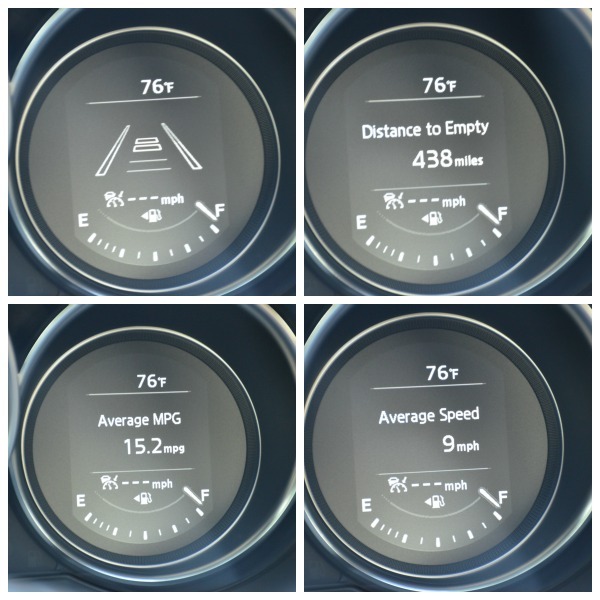 Car distance (from the car in front of you), distance to empty, average speed, and average miles per gallon are some of the information you can see on the dash behind the steering wheel. 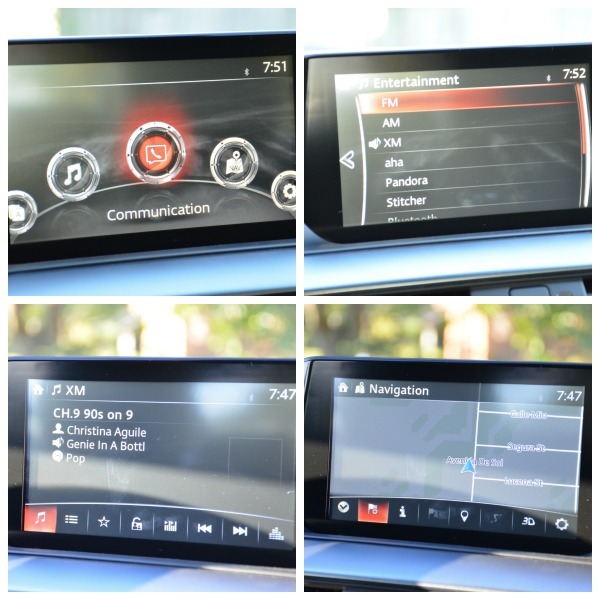 Possible one of my favorite features (in the photo above, top right) is the active driving display. It projects critical driving information directly in front of you, right within your line of sight, without being distracting. The information displayed is vehicle speed, navigational directions, safety alerts, and cruise-control data. The information is strategically positioned directly in the driver’s field of view and above the gauge cluster, this innovative display allows you to process information faster by keeping your eyes focused on one place—the road ahead. The entertainment, navigation and communication center is where you stay connected to fun, family, and where you are going. The 7.0″ color touch screen display is so bright. With AM/FM/CD/USB/Sirius/Bluetooth you truly have the entertainment world ready to go. The navigation system gives you step by step guides to your destination as well as speed limits for all the main highways and upcoming tolls! Connect your phone by Bluetooth and answer calls or listen to your playlists in the Mazda6. As you can see, the controls are all readily available for the driver. Near the gear-shift, you have all the controls for the sound/navigation system, so you don’t have to lean up to touch the screen. 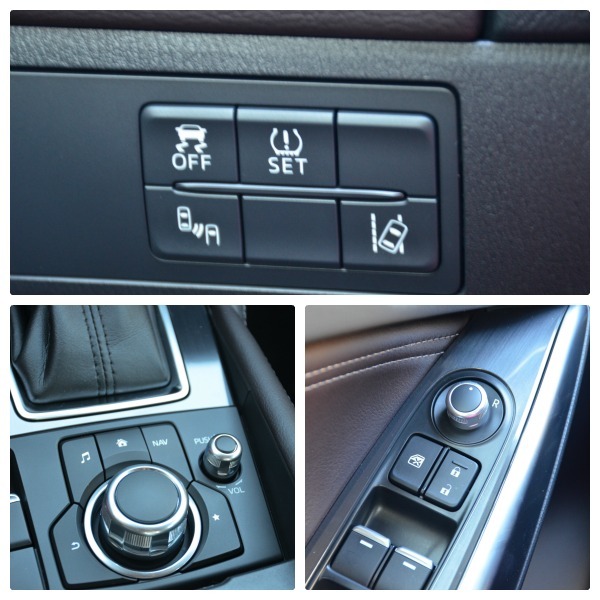 Power locks and windows are at the driver’s fingertips as well! REAR CROSS TRAFFIC ALERT When backing up, this system detects a vehicle approaching from the side and promptly alerts the driver with both an audible and visual warning in both side mirrors and on the 7-inch touch-screen display. LANE DEPARTURE WARNING SYSTEM: This system gives audible and visual warnings when drivers are about to depart unintentionally from their lane at a speed of 44 mph or higher. SMART CITY BRAKE SUPPORT: City driving offers its treacherous obstacle courses. To help avoid or reduce the severity of a collision, the Mazda6 offers an available Smart City Brake Support system. When traveling at speeds between about 2 and 18 mph, this intuitive system detects objects ahead and prepares the vehicle by adjusting brake pads closer to the disc. If no driver action is taken, the system automatically applies the brakes. SMART BRAKE SUPPORT: Similar to Smart City Brake Support, this system is intended to help avoid or reduce the severity of a collision but operates at higher rates of speed (above ten mph) like freeway driving. The Collision Warning feature will alert the driver that braking is immediately necessary. If the radar sensor determines that a collision is unavoidable, the automatic brake control will engage. MAZDA RADAR CRUISE CONTROL: This system judges the relative speed and distance to the car ahead, working within a set speed range to maintain a safe following distance, making highway drives less strenuous. The system’s Close Proximity Warning provides audible and visual warnings when it senses your vehicle fast approaching the one ahead. DISTANCE RECOGNITION SUPPORT SYSTEM: Monitoring the distance between you and traffic ahead just got easier. At speeds above 19 mph, our available Distance Recognition Support System uses radar technology to measure the distance between your Mazda6 and the vehicle ahead and recommends a comfortable following distance. If your vehicle encroaches on this recommended length, a visual warning shows Information Provided by: in the Mazda6’s information display. My thoughts are that I loved the lane departure warning because it would be great for teen drivers, same with the blind spot monitoring. The radar cruise control helps you stay a safe distance from other vehicles. The high beam control was amazing because when it “sees” cars are approaching in the distance it automatically switches to low beams! I loved everything about the iActivesense. 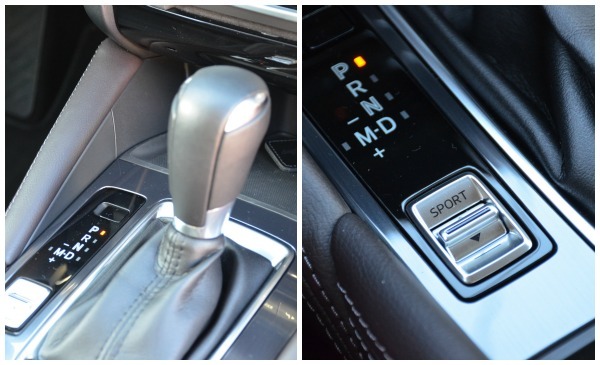 My husband got a kick out of the sport button which altered the shift points and gave it a little more umpfh. The trunk space was enough to fit the luggage of four women, which says a lot, who do not know how to pack lightly. 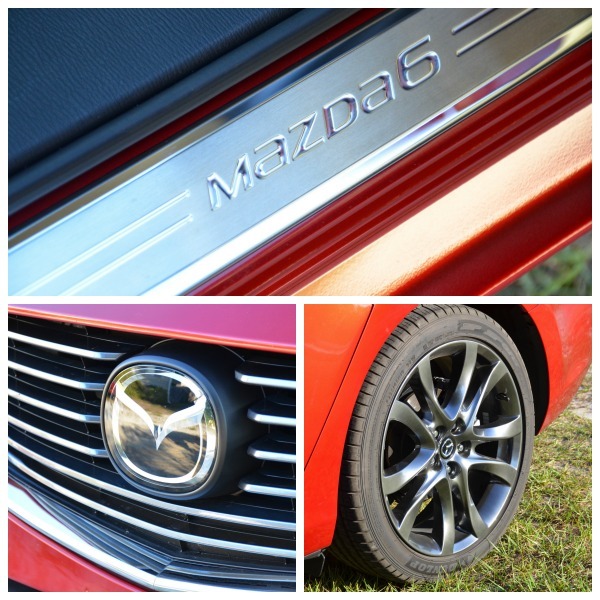 The 19-inch alloy wheels give a look of sleeknes to the Mazda6. With rain-sensing windshield wipers, you can be covered when the weather doesn’t play nice. and many more awesome features! 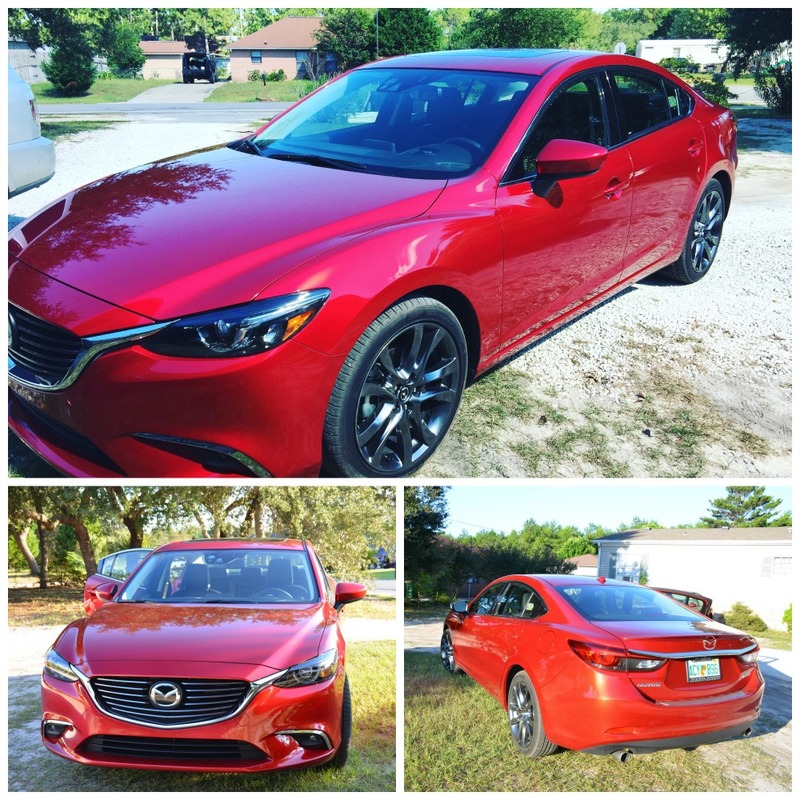 If you are shopping for an everyday vehicle that still has a sporty feel, then you want to consider the Mazda6 Grand Touring edition. It worked for our family of five (though long trips might be a little full) and I could be happy driving this every day! Our family gives it a nine out of ten stars. Not having the third row is the only drawback and why we couldn’t give it a perfect ten. 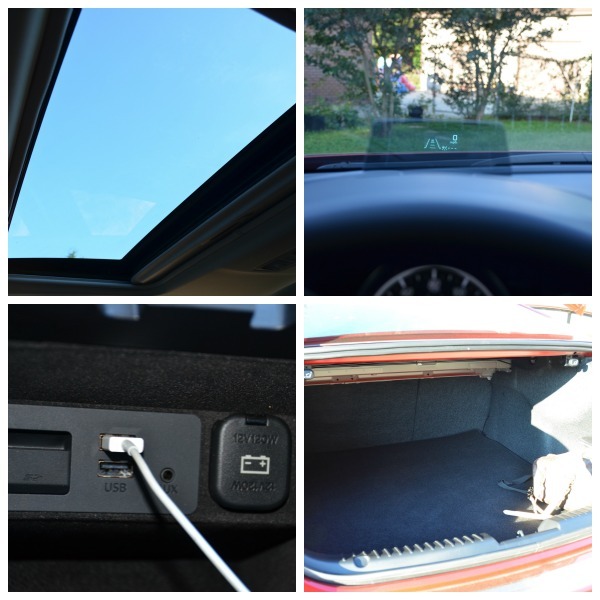 The Mazda6 is a great car; that’s loaded with everything to make driving more fun and safe!